PACK of 7 SPICES and SEASONINGS: Chili powder, ground cumin (jeera), ground coriander (dhaniya), ground turmeric (haldi), garam masala, garlic and coriander seasoning, hot and spicy seasoning. 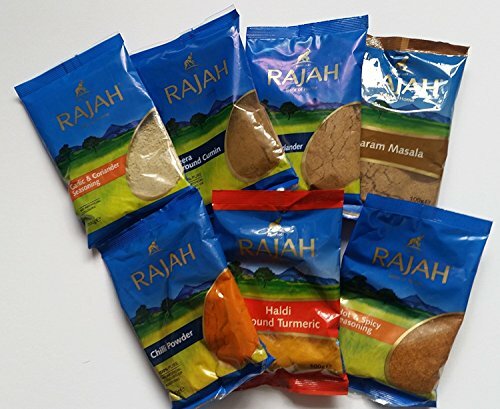 Pack of 7 different Indian spices and masalas to make authentic Indian curries and spicy dishes. Pack contains 100g each of chili powder, ground cumin (jeera), ground coriander (dhaniya), ground turmeric (haldi), garam masala, garlic and coriander seasoning, hot and spicy seasoning. Use them in curries and sauces, and also marinade chicken, meat, fish and/or vegetables before baking, grilling or frying for that wonderful, authentic Indian flavour. Recipe sheet and food preparation suggestions are included in the pack. The spice packs (ground chili, cumin, coriander and turmeric) contain the one single ingredient named on the pack with NO ARTIFICAL COLOURS OR ADDITIVES. The two special seasoning packs have no artifial colours but do have a small amount of additives due to the mixture of spices included in the pack. Garam masala contains Coriander, Cumin, Ginger, Cinnamon, Pimento, Black Pepper, Black Cardamoms, Cloves, Bay Leaves, Nutmeg. Garlic and coriander seasoning contains Salt, Dehydrated Garlic (15%), Coriander (12.5%), Wheat Flour, Flavour Enhancer E621, Onion Powder, Parsley, Coriander Leaf, Pepper, Spice Extracts, Anti-Caking Agent E551. Hot and spicy seasoning contains Salt, Coriander Seeds, Cayenne Pepper, Mustard Flour, Paprika, Dehydrated Garlic, Ginger, Cumin, Red Bell Peppers, Hydrolysed Vegetable Protein, Mint, Spice Extracts, Caraway, Anti-Caking Agent E551. Everything you need for fabulous, authentic, tasty home made curries to inspire and impress your family and guests!